Objectives. To study the cytoarchitectonics, neuronal organization, and distribution of CART peptide-immunopositive cells in the subventricular zone of the brain. Materials and methods. Studies were performed on frontal brain sections from rats (n = 18) using the Nissl, Golgi, and immunohistochemical methods with antibodies to CART (55–102). Specimens were examined by light microscopy. Results. CART peptide-immunopositive cells were detected in the subventricular zone of the inferior horn of the lateral ventricle in the paleoamygdala. These cells had round-oval bodies, one or two short processes, and in terms of their neuronal organization were neuroblastomorphic neurons. Conclusions. 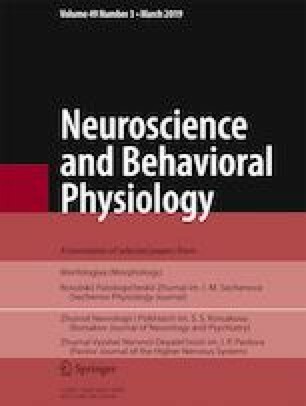 These data provide evidence that cells in the subventricular zone of the paleoamygdala express CART peptide in health. This determines the high efficacy of neuroregenerative treatment with this substance. Translated from Morfologiya, Vol. 153, No. 1, pp. 13–15, January–February, 2018.